Andrea is described by many as "salt of the Earth," and we won't dispute that. While many other producers with excess demand would have simply blended this extra fruit into their own wine to increase their flagship production, Andrea felt this would not only be dishonest, but also a disservice to his clients who have come to love Uccelliera for being 100% from Castelnuovo dell'Abate. Voliero, however, could be different. In keeping with the theme of the Uccelliera name (literally "the birdcage"), Andrea emblazoned the label with a feathered, flying woman. This is also a sly reference to the higher altitude vineyards from which Voliero is sourced. 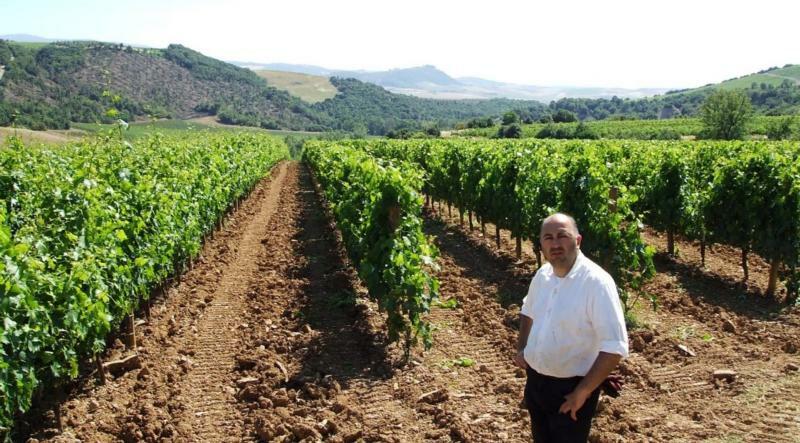 2006, 2007 and 2008 came from Canalicchio, but from 2009 onward, Andrea found other high elevation vineyards closer to home from which to source Voliero. Now in its 11th year of production, some things have changed at Voliero, while most have remained the same. Production is still very limited, with only about 600 cases of Brunello and 400 cases of Rosso produced each year. The vinification, as always, has been fairly traditional: spontaneous fermentation in temperature controlled stainless steel with fermentation/maceration lasting about 20 days. The wine then goes into large Slavonian oak casks of 20 hectoliters and larger for 30 months. But the source of the fruit has migrated from Canalicchio to closer to the winery: the vineyards are now located in both the higher elevation areas of Castelnuovo dell'Abate and Sant'Angelo in Colle. Andrea describes the differences between his two labels eloquently: Uccelliera is a single subzone wine, and reflects the very specific and determined characteristics of Castelnuovo: power, fruit, and profundity. Uccelliera's vineyards are near Ciacci's Pianrosso (about 150 meters above sea level), and reflect the warmth of the area, the flavor profile showing chocolate, leather and "amarena"--sour cherry. Voliero comes from vineyards 200 meters higher in elevation than Uccelliera, and gives the idea of the classic blend of Montalcino Brunello. It combines two high altitude vineyards of Castelnuovo and Sant'Angelo, and plays on the elegance, finesse and brightness that its elevation imparts.